“The truth is no pro-life person would kill baby Hitler. Baby Hitler was a baby,” Ben Shapiro says. 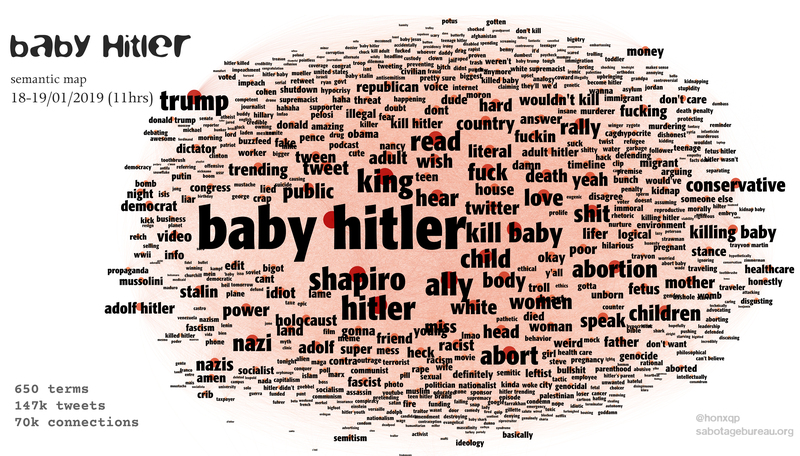 these images are much reduced in size in the blog post column – for a better sense of the scale of the baby Hitler conversation open the image in a separate tab. 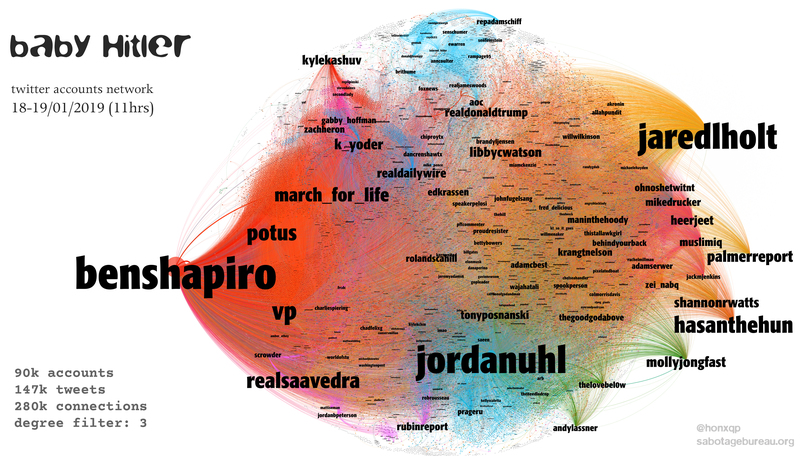 This map of 147,000 tweets is what I’m starting to think of as a standard snapshot of US political discourse – drilling down a bit into smaller nodes and labels the accounts that most often come up are all present – the usual selection of media sources, US politicians, prominent partisan and non-partisan accounts. One one level that’s surprising in this case because it’s a discussion about killing baby hitler, not Kavanaugh or the Green New Deal. On another level it’s not surprising because the issue underpinning Shapiro’s comments and his subsequent rinsing on twitter is one of the major partisan battle-lines in the US, abortion. There are some differences, though, with the ‘standard twitter map’ for American argument, particularly in terms of which nodes are most prominent. In this case, the accounts that were the source of the two tweets that provided the warrant for subsequent discussion naturally feature. So too, though, do accounts of comedians and, I don’t know..wits..who would ordinarily be overshadowed by duller politicians and mainstream media sources. This last seems a function of the subject matter, and perhaps highlights Shapiro’s carelessness in opening himself up to easy ridicule. As usual, for some context for the account-focused map above, I also produced a semantic co-occurrence map of prominent terms used in the online argument. A predictably bizarre set of terms. If there were anyone who hadn’t previously come across the moral quandary presented by future-dictator-hypothetical-infanticide, some entries below could raise an eyebrow. My favourite aspect is the cast of Hitlers the discussion produced – baby Hitler, of course, but also toddler Hitler, tween Hitler, teen Hitler, and adult Hitler. The basis for a franchise, I’d suggest, if the villainous protagonist weren’t seriously, alarmingly, a role model for some people just now.